I spend a lot of time on the road and therefore check my blood sugar in the car a lot. 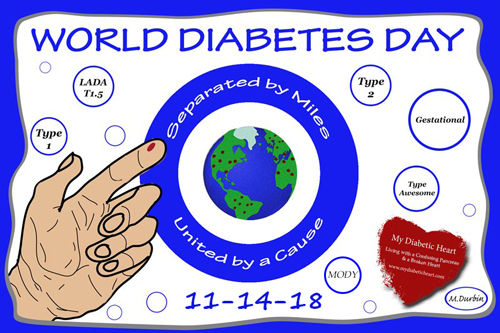 Today is World Diabetes Day. Today we honor Dr. Frederick G. Banting, who was born November 14, 1891, and who is best known for having co-discovered insulin. Happy 127th Birthday, Dr. B. Life support. This is only part of the medications I take each day to manage my bundle of health issues. Diabetes, Congestive Heart Failure, GI issues, etc… I also take injections of Humalog and Lantus. The costs are high. Financially, physically, and mentally. Diabetes doesn’t come with many perks, but the best one has been the people I’ve met over the years. I’m thankful to have spent time with some of them this year. Just emptied the diabetes trash from my meter case. That’s from my travels this weekend. For my friends living with diabetes, how often do you empty the diabetes trash from your case? How do you dispose of it?